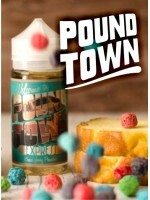 Pound Town - Festival 100mLFestival E-Liquid by Pound Town is a freshly-baked, soft vanilla pou.. Pound Town - Hollows - 100mLPumpkin Pound CakeAvailable in 0mg, 3mg, and 6mg nicotine strengths in 1.. Pound Town - Downtown 100mLWhat happens when fresh, ripe lemons meet buttery pound cake? You just go.. Pound Town - Express 100mLWhat happens when delicious mixed berries meets buttery pound cake? You ju..